This simple apple coffee cake with streusel topping is perfect for breakfast and even better with your afternoon coffee. Serve cold or warm with vanilla ice cream and a drizzle of toffee sauce for dessert. Swap the apples for plums or other seasonal fruit. Do you have a go-to bake when the weather is dreary and gloomy and the last thing you want to do is be in any way active? Rainy weekends are always ripe for baking, but I didn’t realise that I had a signature ‘rainy day’ bake until my husband pointed out the obvious. “Baking your apple cake again?”, he asked me on a recent, surprise surprise, rainy Saturday. Well, now that you mention it… This apple coffee cake is perfect for rainy weekends because it is so easy to throw together. Even if baking is the last thing on your mind, this cake is a bit like rainy day therapy. You get to use all the slightly dented or past their best apples in your fruit bowl. You get to get your hands stuck into the streusel, rubbing the butter, sugar, and flour together to make simple magic. You get to perfume your house with the most amazing aroma of baking apples and cinnamon – equal only to the aroma of freshly baked bread in coziness stakes. You can replace the apples with pears, plums or peaches depending on your mood or season. As long as it’s raining out, you can’t go far wrong! The sponge cake base is literally thrown into a mixing bowl and just mixed together all in one. The trick is to use soft butter, or, failing that, margarine. The ingredients need to all be at the same temperature in order to mix together well. The recipe is easy to remember because it’s basically a pound cake – equal amounts of flour, sugar and butter. Spread the batter into a springform cake tin then top with the apple slices. Spread the streusel topping over the apples and bake for 50 minutes. Top with a little toffee rum caramel sauce if you want to dress the cake up slightly – it takes just a couple of minutes to make from scratch and it tastes heavenly. Share the cake with friends over a strong cup of coffee… Or serve it warm, topped with vanilla ice cream and a drizzle of the toffee sauce for dessert. Either way it will taste delicious! I couldn’t resist adding a little crumbled meringue over the cake when I was photographing it. But this was more to create some texture in the photo than for any other purpose (busted!). Coffee cakes are cakes intended to be paired with a cup of coffee or tea, not, as I originally thought, cakes actually containing coffee. 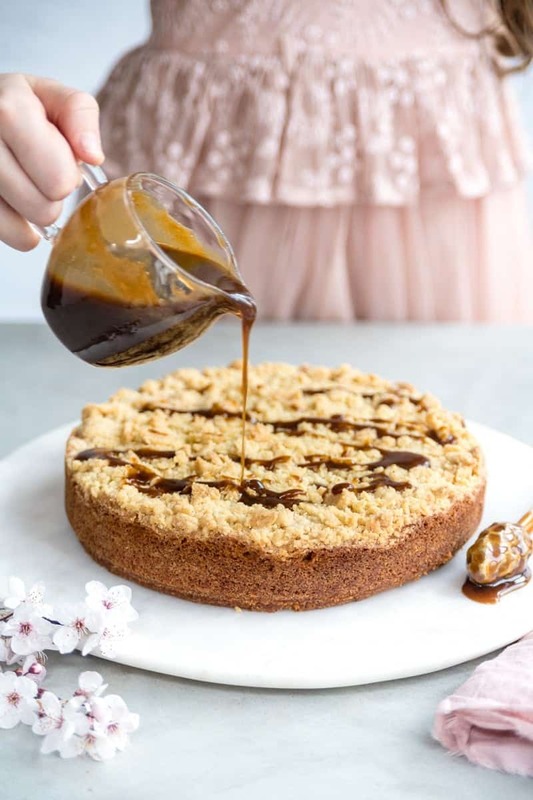 And it just so happens to be coffee cake day to day, so I have partnered with a bevvy of amazing bloggers to share an awesome round up of coffee cake recipes. This simple apple coffee cake with streusel topping is perfect for breakfast and even better with your afternoon coffee. Swap the apples for plums or other seasonal fruit. Preheat the oven to 180°C (350°F) and spray a 20cm /8inch springform tin with cake release. Line the bottom with baking paper and spray again. Sift the flour, baking powder and cinnamon into the bowl of your stand mixer. Add all the other ingredients and mix together with the paddle attachment on low speed setting until combined. Increase the speed and mix for 2 minutes, scraping the bowl halfway, until the ingredients are all evenly mixed and batter is smooth. Transfer the batter into the prepared tin, level and arrange the apple slices over the top. Put all the streusel ingredients into a bowl and rub them between your fingers until you have a crumbly texture. Alternatively pulse all the ingredients together in a food processor. Cover the apples with the streusel, pinching the crumble between your fingers to create some large pieces. Bake for 50 minutes. Remove from the oven and cool in the tin for ten minutes then carefully turn the cake out onto a plate. Make the toffee sauce: stir the ingredients over medium heat without boiling until the sugar has dissolved. Simmer for three minutes and transfer into jar to cool. Drizzle a little of the toffee sauce over the cooled cake or serve the cake warm, topped with vanilla ice cream and drizzled with the sauce. Would enjoy every single bit of it ! Thank you ! Beautiful! I love anything apple flavoured so I’ll have to try your coffee cake. This cake looks just lovely – I love the addition of apples, and that toffee sauce is the perfect finishing touch. I can see why it would be your favourite thing to bake on a rainy day! Thanks Isabelle I love the simplicity of it! 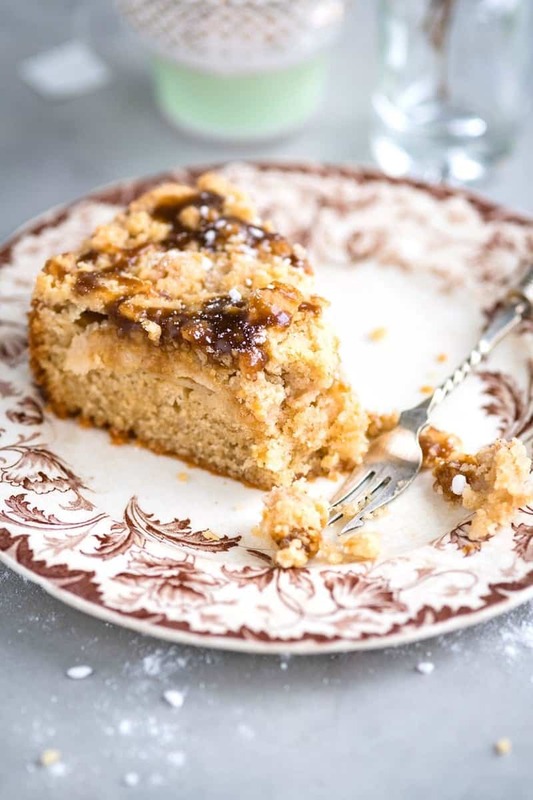 Your photos are gorgeous, and the coffee cake looks absolutely scrumptious! I love apples and cinnamon in baked goods, so I would love this!